Those with invisible physical disabilities are widely thought of as lazy, moody, or incompetent, due to not having any visible sign of illness, as in a cane, walker, etc. However, we know that this is not the case. 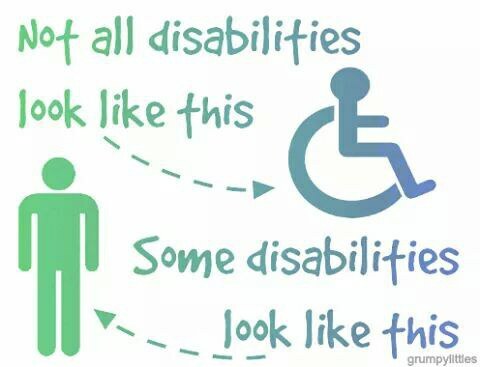 It is believed that at least 10% of the United States population has some sort of invisible disability, however this spectrum covers both neurological disabilities and physical disabilities. For the sake of this article, I will mainly focus on those of us who have invisible physical challenges, like myself. In my own situation, I have a very rare invisible disability called Myotonia Congenita. There are two main types to this disease: Thompsons and Beckers. My symptoms include muscle tension and stiffness in most voluntary muscles, slower reflexes, rapid and abnormal muscle growth, and muscle aches. For example, when I stand up from sitting for varying periods of time, my muscles contract and don't relax immediately, which means I can't begin walking until my muscles have relaxed. This can cause me to do multiple things: lose my balance and fall back into my seat, face plant into the floor, or pause and stand in one spot until I feel like I can move my legs again. Because of this, I have a D Pass (disability parking pass) for school and also a regular disability window hanger for my car. Because I look like a very healthy person who works out constantly (and I don't), I have been given angry looks when I park in a disabled spot. I have had to explain to people that, when they push me, I can't catch myself like an average person. I have had grown adults get angry with me because I have to walk slower. I've even had people grunting, groaning, and making comments behind me on stairs because I walk incredibly slow up them and I can't do anything about it. I know others with my condition carry around a cane despite not needing it, only because if there's no visible sign of ailment on our bodies and they have had enough encounters with angry people who don't understand our disease is invisible. Here are a few things I really wish people would stop staying to those of us with invisible physical disabilities. 1. "But you don't look disabled." I mean, that's the point of having an invisible disability. Unless I point it out to you, it's not obvious. Instead maybe say, "Can you explain your disability more?" or "What sorts of symptoms/problems do you have?" Asking more questions leads to a better discussion. 2. "I don't even think of you having a disability." This is part of the problem. Since our disabilities are not incredibly noticeable, it's easy to overlook them. Although this one does irk me, it's slightly more tolerable, since I do understand that you probably don't notice that I purposefully pause to look at my phone or fix my clothing when I stand up because, if I don't, I'll collapse. Or when you take off at a run, that I'm falling behind because my body won't let me spontaneously run at any given moment. Use this sentence with caution. 3. "How did that happen?" Most invisible disabilities have been cause and effect. In my case, I was born with Myotonia Congenita ("congenital" means "from birth"), which was passed to me by my father who has one of the smallest cases of MC that I know of. Instead of flat out asking what the cause and effect is, ask if there was anything that caused it by saying, "Was there something that happened to you to cause your disability?" 4. "Have you tried medication or surgery?" I've heard this many times. Please do not say this to anyone because maybe we have tried medication and it hasn't helped or maybe we don't want to or maybe there is no medication to help us. Instead say, "Are there any medications or surgeries that can help you?" 5. "But you're so young!" Nope. Don't even start with this one. 6. (For those who can't relax their muscles) "Just relax." I broke my leg as a kid and the only doctor on call was this horrible man who kept getting angry at me because I couldn't relax my leg enough for him when he was putting my cast on. No, I can't just relax. That's not how it works. Instead ask, "Is there any way you can try to relax a little more?" 7. "You just wan't attention," or "You're just imagining things." 8. "Are you always this lazy?" For some of us, physical activity of any sort can wear us out and put us on the couch for a day or two, sometimes more. It's not laziness, it's our body's exhaustion. Sadly, though, there are a few who do use their disability as a way to just be lazy. However, I still would never say this to anyone because you don't know how they are feeling that day. Instead ask, "Are you feeling OK today?" or "Is your body OK to do (blank) today?" I'm pretty sure my doctor wouldn't have given me the write-up to have one if I didn't need it in some way. All in all, if you don't understand the person's disability, just ask them to explain more about it.